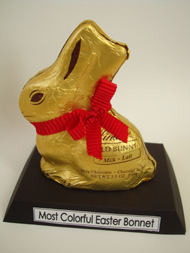 This Bunny Award is great to give to friends and family, or is also a really cute prize for any Easter party game or contest. All you have to do it write your own message on the front! You can write "Happy Easter to my #1 Friend" or "Grandma", or if you having an Easter Bonnet contest you can write "Most Colorful Easter Bonnet"
Keep in mind the weight of the object you are putting on your trophy stand. If you are using our template made with card stock only use small, hollow treats - otherwise the card stock will not hold it up! If you are using a box you will be able to put something larger and heavier on top! 1. Trace your template onto a piece of black card stock (or other sturdy paper. 2. Fold all four edges and tabs. Spread glue on the tabs and press the sides together. Remember that the tabs should not show - they go on the bottom, or inside of the stand. 3. On a small strip of white paper write your message and glue onto the front. Lastly, glue on your bunny. Make sure you give your Bunny Award lots of time to dry!